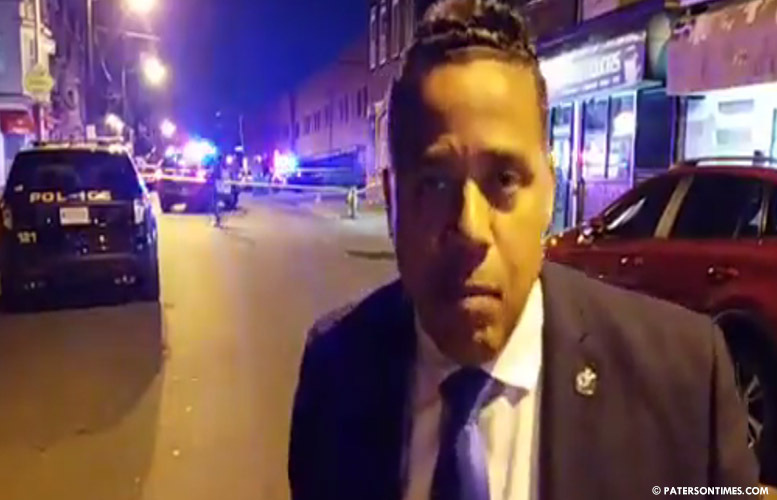 Councilman Alex Mendez, who hours earlier received criticism for being “soft on public safety and crime,” tried to bolster his public safety credential by filming on Market Street minutes after a “drive-by” shooting on Monday night. Mendez points out the shooting happened steps away from his campaign office. He also points out there are children on the sidewalks. He is approached by a woman. “How you doing neighbor? How are you?” Mendez greets her, shaking her hand. Velez and Mendez are enemies on the council. He disagrees with Mendez and opposes his run for mayor. Velez is backing councilman Andre Sayegh for mayor. “That’s mistake number one, doing live reporting and asking people,” said Velez on Tuesday morning. “I think she was confused with him,” said Velez. He said it seemed like Mendez was trying to push her to say she sees him on the street. Velez said he was at the scene soon after shots were fired in the area. A 25-year-old man was wounded at about 7:08 p.m., according to police. Velez said at least his constituents can say he is visible. Velez has been on the council for less than two years. Mendez has been on the council for almost four years. If he loses the May election, Mendez will find himself without a seat. He is one of six men running for mayor. The others are William McKoy, Michael Jackson, Alex Cruz, and Pedro Rodriguez. Mendez did not respond to a call for comment for this report. Velez, who represents the 5th Ward, where the shooting happened, said he requested a police mobile camera unit for the intersection. This bulletin is part of a series of brief reports on the Paterson mayoral race. Read all our reporting on the Paterson mayoral election by clicking here. What a joke. Pay your bills deadbeat! I see this clown at my gym all the time. That's about a 25 minute ride from Market Street Paterson to Wayne NJ. I'm sure he pays his $42 a month on time otherwise he would not be working out there. How come you can't pay your water bill on time? This guy claims to represent the people of Paterson, yet he can't join a local gym in the community. Why? The town is inflicted with crime and let's be honest unpleasant to look at, do to the litter. We have seen this time and time again. People in the city are used as a stepping stone for want to be politicians. Who cares if he pulls out a camera and stands where a crime happened, what does this even mean? He gives no solutions to a serious problem. I will give the guy more respect if he tells these thugs to stop destroying the community and take responsibility. Cities like Paterson can't afford another 30 plus years of these politicians. now he wants to be a reporter.